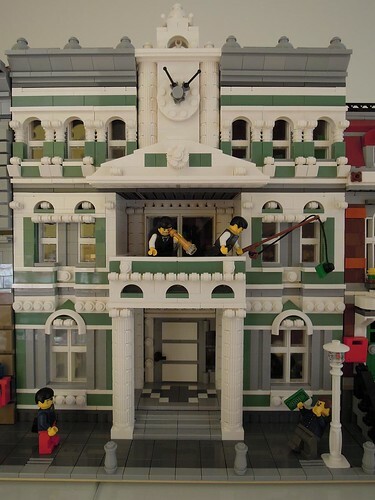 Brick Town Talk: Fiscal Balcony - LEGO Town, Architecture, Building Tips, Inspiration Ideas, and more! Certainty Street - (BTT) We're just a few hours into the new year, and already there are a bunch of people in a panic over the state of their taxes. However, not everyone is doom and gloom it seems. Here at the Tax Office, business has never been better nor has the future ever looked brighter. Housed in a building the same color as your hard earned dollars, the head honchos are always willing to go over your deductions (and help you improve your putting). Refunds are hard to come by, but if you have long arms and a decent vertical leap, you might get back a little of that paycheck.